In a previous article found here I postulated that the S&P 500 was currently fairly valued. In this article, I review a specific hand-selected list of Dividend Champions that I believe are reasonably priced and therefore capable of generating above-average returns at below-average risk. In today’s low interest rate environment, I believe that high-quality blue-chip dividend growth stocks represent an attractive asset class that can provide a retirement portfolio with a growing income stream. Once we reach retirement, investing becomes all about income and safety. Yet over the years one of the greatest laments of the retiree is the struggle associated with living on a fixed income. Retirees have been conditioned to the notion that once they reach retirement age they must become completely risk-averse regarding their investing practices. Therefore, they end up holding portfolios full of fixed income with little or no growth of either income or principal. However, it doesn’t have to be that way. I believe that retirees can have their cake and eat it too. If they adhere to sound principles of investing, they can have safety, growth, and an increasing income each year. Perhaps the most important consideration regarding the appropriate investment practices of retirees relates to how you define risk. In my opinion, too much emphasis is being placed on short-term price volatility as a primary determinant of risk, and too little on maintaining an appropriate standard of living that can keep up with inflation. A portfolio that provides a fixed rate of return or income stream is continuously decimated by the ravages of inflation. In other words, no matter where it comes from, the loss of purchasing power is a major risk that retirees face. Therefore, I argue that retirees should place great emphasis on building a portfolio capable of producing an increasing income stream. In order to accomplish that goal, it is imperative that a portion of the retiree’s retirement fund be allocated to equities in some form or another. Carefully selected equities can provide the growing income stream that fixed income investments cannot. Although price volatility is clearly an unavoidable attribute of equity, there are equity classes that do provide a consistent and ever-growing income stream. Therefore, I am suggesting that more emphasis be placed on the income component of the equity portion of the retiree’s portfolio, then on the price volatility of the underlying shares. Although price volatility can be unnerving, I plan to show evidence that in the longer run, price volatility is more often than not a paper tiger. 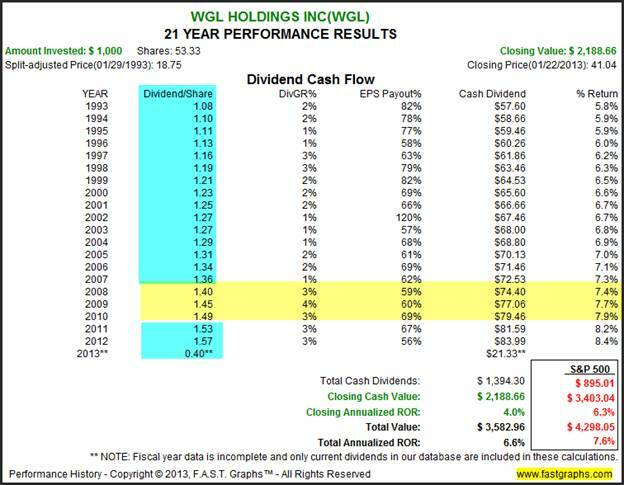 There is a category of dividend growth stocks where the majority of them possess all seven of Ben Graham’s quality and quantity criteria. This category is widely known as either Dividend Champions, as produced by David Fish and/or Dividend Aristocrats published and maintained by Standard & Poor’s. I have gone through these lists one company at a time utilizing the fundamentals analyzer software tool FAST Graphs™, and identified the Champions and Aristocrats that I believe most closely exemplified Ben Graham’s stock selection criteria. Although all seven of Ben Graham’s criteria listed above are important, the primary focus of what follows relates to number four - the Dividend Record. Ben Graham believed that the conservative investor should only consider companies that have paid a dividend every year for at least the last 20 consecutive years. He believed that dividends represented a strong proxy for profitability since they are paid from earnings, and he liked the idea that they offered investors a return even when the company’s stock price was not cooperating. This last point is a critical element of the thesis behind this article, and will be elaborated on more fully later. However, Dividend Champions and/or Dividend Aristocrats go one step better than Mr. Graham’s stringent dividend criteria. Not only have they paid a dividend for 20 consecutive years, in order to make these elite lists, they have also had to have increased their dividend each year for at least 25 years consecutively. Moreover, almost by definition, in order to have accomplished these dividend achievements, they for the most part simultaneously and automatically meet the other six criteria as well. (Note: Later when I show sample FAST Graphs™ on a few individual examples, wherein all the attributes that Ben Graham coveted will be graphically revealed). The Dividend Champions’ list currently has 105 names on it, and the Dividend Aristocrats currently has 51. All of the Dividend Aristocrats can be found in the Dividend Champions list. Therefore, I have hand screened the Dividend Champions one company at a time looking for those candidates that I believed best exemplified Ben Graham’s criteria, while simultaneously could be bought at fair value. It should be noted that my selection process was partially arbitrary where I excluded companies which did not possess the consistent records of earnings that I prefer. Through this process I have identified 33 of the 105 Dividend Champions that met Ben Graham’s criteria and were simultaneously trading at fair value. Although I believe that each of these Dividend Champions is an extremely high-quality company, this list is offered as a precursor to a more comprehensive due diligence process. On the other hand, I strongly believe that each of the 33 companies on this list represent excellent long-term dividend growth investments. However, their relative attraction will be a function of the individual investor’s own goals, objectives and risk tolerances. In other words, although I think all of these candidates possess attractive total return potential, some will be more appealing for their yield, others for growth, and yet others for a combination of both. In order to illustrate the return and income potential of each of these selections, I have broken them down into subsets based on cap size and earnings growth rates. I start with the fastest-growing large caps and then progressively move down to slower growth and smaller cap sizes. I believe this is an important way to review these opportunities, because all Dividend Champions are not the same. Some grow faster than others, some are bigger than others, some have higher yields than others, etc. Consequently, even though they are all Dividend Champions, they offer various levels of return, yield, growth, and therefore, risk. At this point I believe it’s useful to interject that future returns comprising of both capital appreciation and dividend income will be a function of each company’s earnings growth rate, and the valuation you pay to invest in it at purchase. But as I have previously alluded to, some Dividend Champions grow fast and some do not. Consequently, and as a general rule, assuming that each is bought at a correct valuation, faster earnings growth should produce the highest long-term returns, but do so at higher relative risk levels. Moreover, higher yield may produce greater total income, but perhaps a lower total return. Therefore, each situation should be examined based on its own characteristics and merits. For additional clarity, I feature a sample company from each of the subsets. I believe these specific examples will provide greater insight into the opportunities that are currently available from high-quality Dividend Champions found in the various subsets presented. Once again, I remind the reader that all Dividend Champions are not the same. Some grow faster, some yield more, some are riskier than the others, etc. Therefore, comprehensive due diligence is suggested on each company based on its own unique qualities and opportunities. 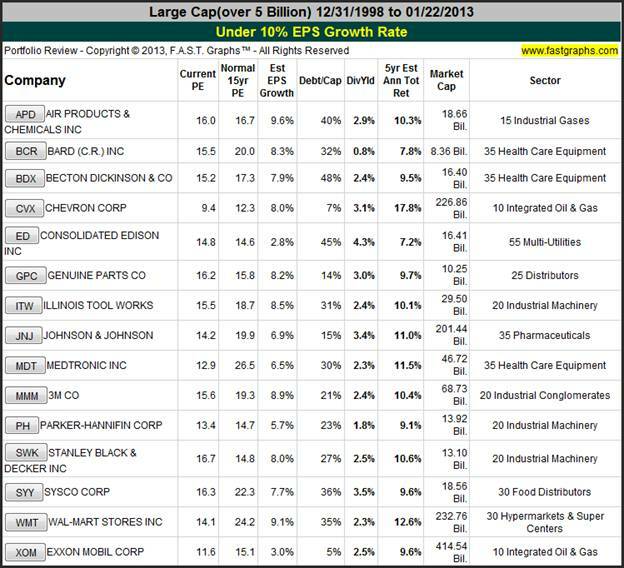 I have listed these in-value Dividend Champions by order of cap size and historical earnings growth rates highest to lowest. This first set of 10 is mostly comprised of well-known Dividend Champions, and is presented as a select list of attractive candidates worthy of additional due diligence. Some of the stocks on this list are extremely undervalued (AFL), while others I would classify as fairly valued. As previously mentioned, some are more appropriate for total return, some for a faster growing dividend, and others for yield and/or growth of yield. The sample company I have selected for this first subset is Dover Corp. As with all of my following selections, I chose Dover because I believe it offers important lessons on long-term investing. First of all, notice that there is a certain amount of cyclicality depicted by the occasional volatility of the orange earnings justified valuation line, but longer term Dover achieved above-average earnings growth. It’s important to notice how price tracks earnings very closely throughout this time frame. 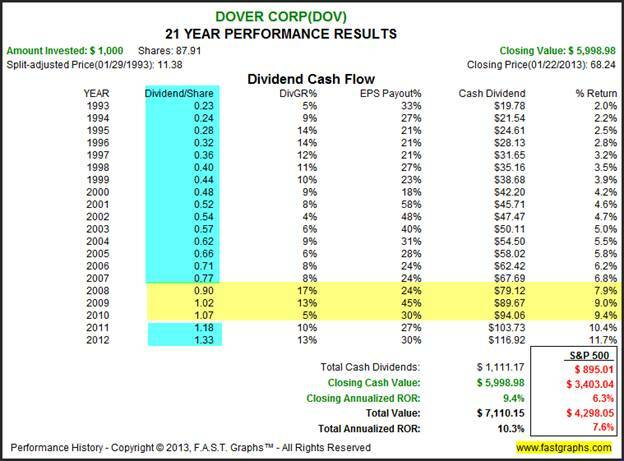 However, as I will show when we look at performance, Dover’s dividend income increased each and every year. But most importantly, there is one lesson that this graph and all the subsequent graphs will illustrate. A significant amount of criticism is directed towards common stock ownership as a result of the Great Recession of 2008. However, as I previously indicated, I believe that both recessions and the stock price action that accompanies them is, in truth, a paper tiger for those with clear knowledge supporting the ownership of blue-chip stocks. In this Dover example, it is clear that both earnings and stock price fell during the Great Recession. However, what is not so clear, or often forgotten, is the fact that Dover’s dividend increased each year, including the recession years. 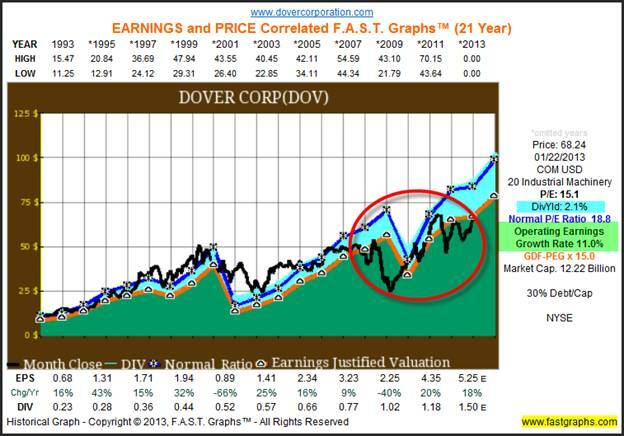 Moreover, it should be noted that Dover’s stock price and earnings have both recovered and achieved new highs as the recession ended and the economy began to improve (see red circle on graphs). Therefore, the lesson is that temporary stock price and earnings declines associated with blue-chip profitable businesses will usually only hurt you if you panic and sell. An experienced and knowledgeable dividend growth investor knows to ignore these temporary bouts of volatility and focus more on the income they are receiving, which is their primary objective. As I previously noted, the earnings and price correlated graphs do not have every year typed in due to space constraints. Therefore, Dover’s dividend growth record is best viewed by looking at the dividend cash flow table on the performance graph with each year’s data included. 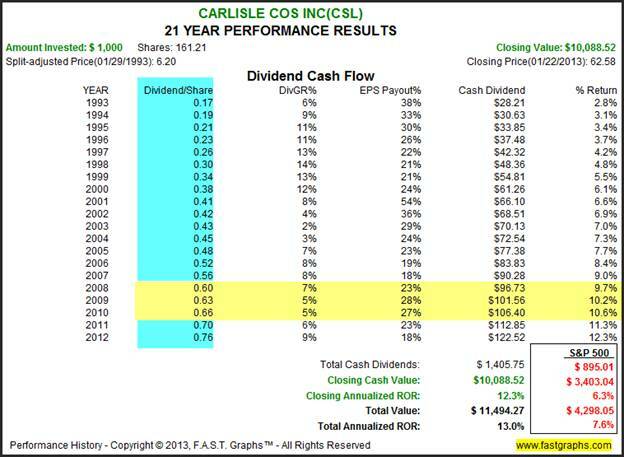 I highlighted the Dividend/Share column in dividend blue to show that Dover’s dividend increased every year. I highlighted the recessionary years in yellow to illustrate that the dividend continued to grow right through the recession, notwithstanding the fact the both earnings and price had temporarily fallen. Our second subset contains Dividend Champions whose future earnings growth is expected to average 10% or less. Once again, this list contains well-known blue-chip stalwarts that are highly recognizable. As was with our previous subset, all of these companies are represented as being priced at fair value or below. With this second subset I chose 3M Co as our sample because it offers an additional investing lesson that our Dover example did not illustrate. 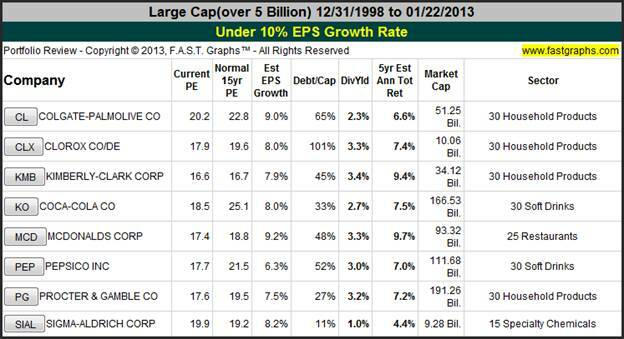 Note that 3M Co had a legacy of being historically overvalued by the market. Therefore, when the Great Recession of 2008 occurred, 3M Co’s stock price was brought back into fair value range before falling into significant undervaluation territory. However, note that earnings and price recovered as they did with Dover. 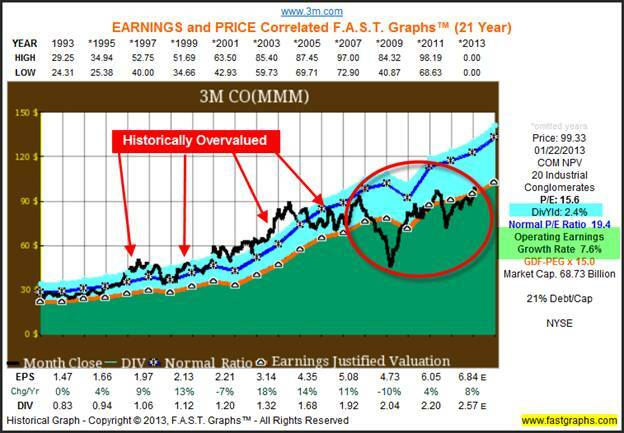 However, due to previous overvaluation, 3M Co has only returned to its pre-recession high. Nevertheless, this once again illustrates that recessions will only hurt those that fear them. 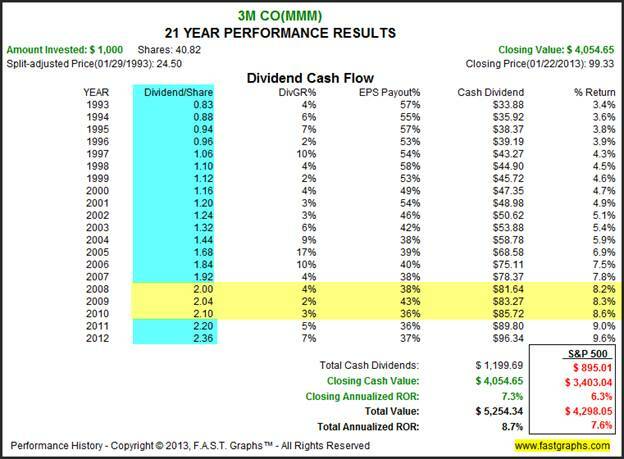 As you saw with Dover, 3M Co’s dividends increased every year up to, through, and after the Great Recession. Consequently, level-headed dividend growth investors focusing on their income stream experienced only a temporary effect on their portfolio’s capital value, however, their dividend income continued to increase uninterrupted. Our next subset contains mid-cap companies with future earnings growth expected to be between 10% - 15%. In theory, mid-cap companies could be expected to grow earnings and dividends faster due to their smaller size. Our faster-growing mid-cap sample is Carlisle Companies, Inc, an industrial conglomerate with an above-average long-term growth rate with moderate cyclicality in between. Here again we see a repeat of the lesson that recessionary price drops are temporary and capable of recovering as the economy recovers. Investors knowledgeable about this company could have avoided panic-selling at the bottom, especially if they were focused on the ever-increasing dividend. Precipitous stock drops are scary and painful to go through, but mostly temporary regarding blue-chip dividend stalwarts. 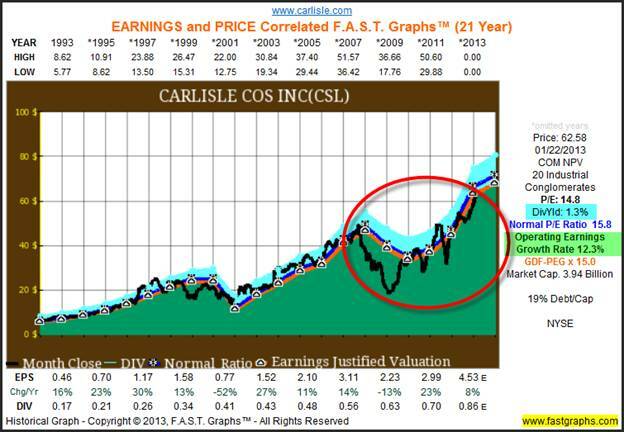 As with our previous examples, Carlisle continued to raise their dividend every year, including the recessionary years. Therefore, the dividend growth investor whose goal was a rising income stream, was unaffected by the recession as long as they did not panic. 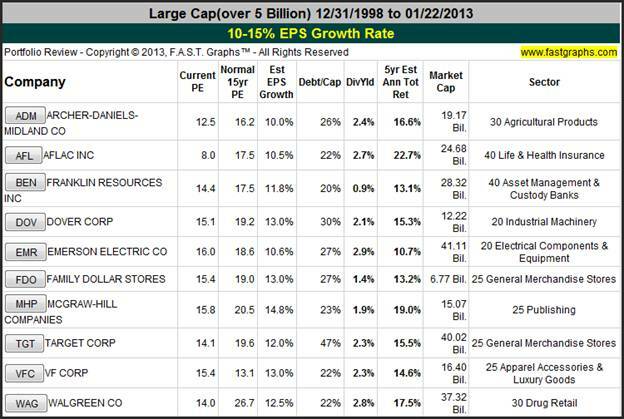 Our next subset contains mid-cap companies with future earnings growth expected to be 10% or less. It is interesting to note that some of the higher-yielding stocks in the group are contained in this subset. WGL Holdings Inc is a gas utility that saw very little stress during the Great Recession. Earnings did flatten a little and the stock price fell only modestly, however, the dividend increased each year. 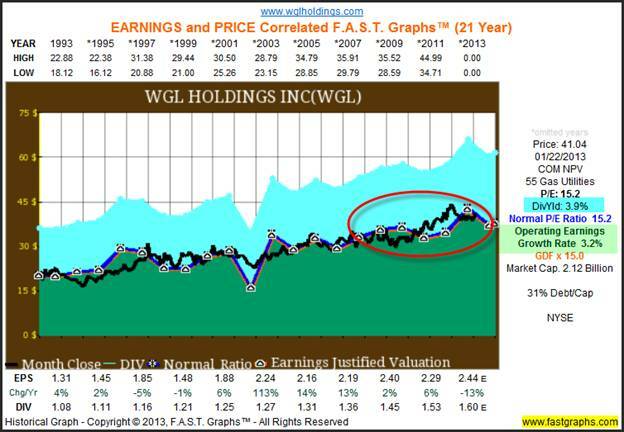 Utilities such as WGL Holdings Inc do not grow very fast, but typically offer a high starting yield. Consequently, they can be utilized to increase the overall yield of the entire portfolio but lack the growth characteristics of faster-growing Dividend Champion counterparts. Our next subset contains small-cap companies with future earnings growth expected to be between 10% - 15%. In theory, small-cap companies could be expected to grow earnings and dividends even faster than mid-caps due to their smaller size. Our next subset contains small-cap companies with future earnings growth expected to be 10% or less. 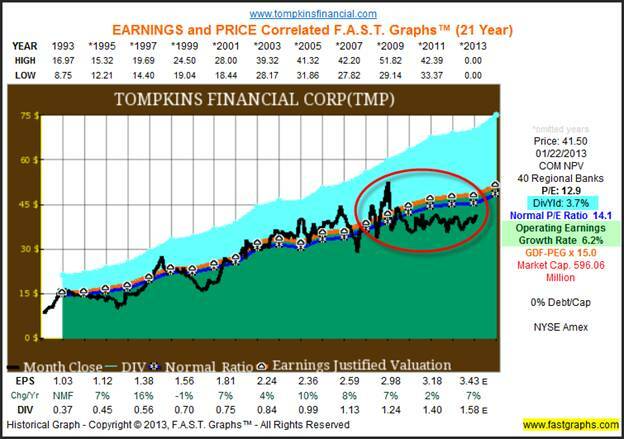 As we saw with the slower growth mid-cap subsets, Tompkins Financial Corp (TMP) offers an above-average current yield. Interestingly, Tompkins Financial Corp saw very little operating stress during the Great Recession. However, their stock price did fall, but a lot of its drop can be attributed to overvaluation. Nevertheless, as with all other examples in this article, the company did continue to raise their dividend each year. 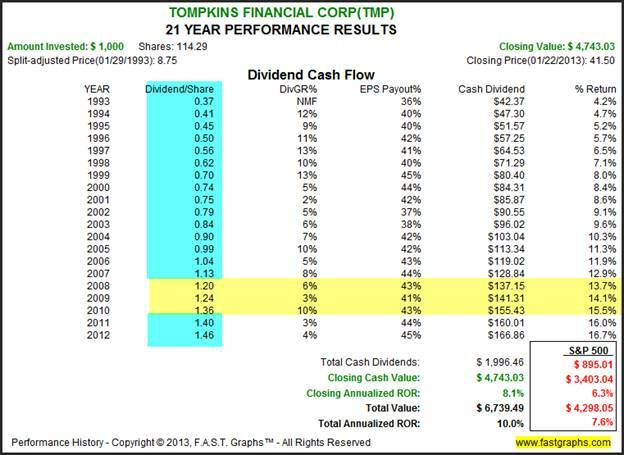 As it was with all of our previous examples, Tompkins Financial Corp continued to raise their dividend every year, including the recessionary years. Therefore, the dividend growth investor whose goal was a rising income stream, was once again unaffected by the recession as long as they did not panic and sell. In addition to the 33 fairly valued Dividend Champions, I identified and selected an additional 17 that I consider moderately overvalued. To be clear, moderate overvaluation does not imply that a stock is not a good investment. And, in fact, some of the moderately-overvalued candidates could produce greater returns at lower risk than some of its more fairly valued counterparts. In other words, moderate overvaluation implies that the stock is not excessively cheap, but it does not imply that it might be a poor investment. Instead, moderate overvaluation suggests that you are perhaps paying full value instead of a bargain valuation. On the other hand, moderate overvaluation could also imply that with patience you might be able to invest in the candidate at a better price in the near future. Therefore, it might pay you to closely follow the moderately-overvalued candidate in the event that market weakness may present a better entry point. But again, moderate overvaluation does not necessarily mean that it would be unwise to begin building a position if you really like the candidate. For example, moderate overvaluation may simply be indicating that the market is telling you that the company warrants a quality premium over other candidates that possess greater risk. These distinctions can only be made through research and judgment, and I argue only based on the individual merits of each company in question. I offer the following long-term look at Kimberly-Clark Corp. (KMB) as a case in point. 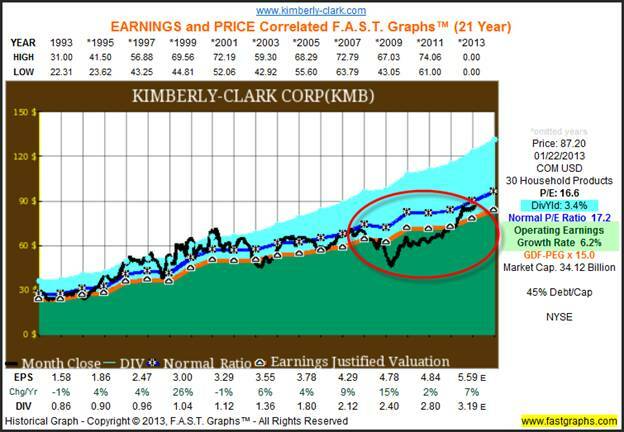 The orange earnings justified valuation line represents the intrinsic value of Kimberly-Clark. Clearly, the black monthly closing stock price line indicates that this high-quality blue-chip has often been awarded a quality premium by the marketplace. More simply stated, the black price line is most often above the orange fair valuation line. In the same vein, it should also be noted that the patient investor will from time to time be given opportunities to invest in Kimberly-Clark at a bargain price, in other words, when the price is below fair value (the black price line below the orange earnings line). On the other hand, when you consider the company’s excellent dividend record and above-average yield, it begs the question of whether it’s wise to be out of this investment or not. Kimberly-Clark has a very low beta of .30 - .50 depending on what source you use. 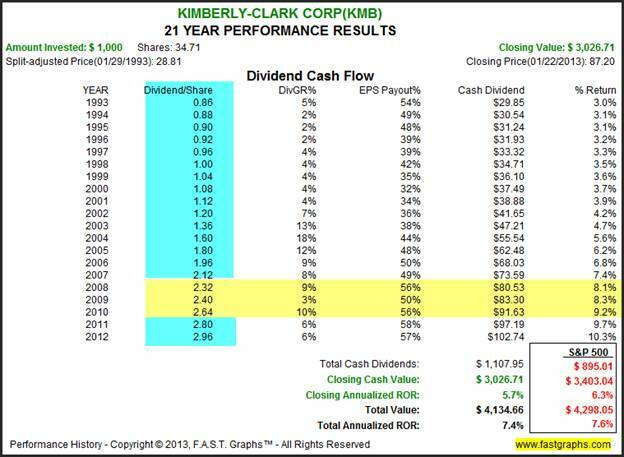 The following long-term performance table clearly illustrates that Kimberly-Clark is more of an income investment than it is a growth investment. However, it should not be left unsaid that if you’re patient enough to buy the stock when it is undervalued, your returns will be higher, and you’re already low risk even lower. The following represent the 17 moderately overvalued Dividend Champions that should be monitored for potential better entry points. However, as previously stated, I do not consider any of these candidates to be significantly overvalued, and in many cases, some of these names warrant a premium valuation. Therefore, buy, sell or hold decisions should be researched deeper and made one company at a time based on its own merit, history and valuation. This article was presented to express the fact that currently there are several blue-chip Dividend Champion stalwarts that can be invested in at attractive values for long-term growth and an increasing dividend income stream. In today’s low interest rate environment, the opportunity to invest in blue-chip Dividend Champions at sensible valuations provide a level of safety and performance that I believe is suitable for retirees. Normally I would suggest a blend of equities and fixed income where the fixed income was designed for maximum current income, and the equities designed to provide a raise in pay each year. However, with interest rates so low today, I feel that fixed income (bonds) is aberrantly risky, and therefore should temporarily be avoided. The retiree does not need to be faced with the challenge of living out their retirement years on a fixed income or budget. Investing in quality dividend blue-chip paying stocks is not as risky as some believe especially for those whose focus is more on the income stream than it is on price volatility. In truth, I only need to look to financials during the Great Recession to find examples where price drops and dividend cuts were more permanent than what was discussed in this article. However, for those dividend growth investors practicing proper diversification, where any individual company only represented a small portion of their portfolio (2% - 5% invested in any one holding) would have only suffered minimal and temporary consequences. In other words, the price drops soon recovered, but there was never any major interruption in their dividends or the average growth of their dividends. My key point is that price volatility, even during a recession, is, as previously suggested, only a paper tiger for those with the foresight to intelligently ignore it. Finally, there are plenty of high-quality reliable Dividend Champions that can be utilized by the retiree as safe and strong candidates that can be used to create an increasing dividend income stream. The list of companies presented in this article represent a list of attractive blue-chip stalwarts currently available and worthy of a more comprehensive research effort. As Ben Graham intimated, companies that have a long legacy of paying a dividend, and in this case even increasing it, are indicative of healthy and strong profitable enterprises. Therefore, I recommend investors close to or already in retirement should take a closer look. With my next article I will similarly cover fairly valued and moderately valued Dividend Contenders. Disclosure: Long AFL, DOV and KMB at the time of writing. Charles (Chuck) C. Carnevale is the creator of F.A.S.T. Graphs™. Chuck is also co-founder of an investment management firm. He has been working in the securities industry since 1970: he has been a partner with a private NYSE member firm, the President of a NASD firm, Vice President and Regional Marketing Director for a major AMEX listed company, and an Associate Vice President and Investment Consulting Services Coordinator for a major NYSE member firm. Prior to forming his own investment firm, he was a partner in a 30-year-old established registered investment advisory in Tampa, Florida. Chuck holds a Bachelor of Science in Economics and Finance from the University of Tampa. Chuck is a sought-after public speaker who is very passionate about spreading the critical message of prudence in money management. Chuck is a Veteran of the Vietnam War and was awarded both the Bronze Star and the Vietnam Honor Medal. © 2013 Copyright Charles (Chuck) C. Carnevale - All Rights Reserved Disclaimer: The above is a matter of opinion provided for general information purposes only and is not intended as investment advice. Information and analysis above are derived from sources and utilising methods believed to be reliable, but we cannot accept responsibility for any losses you may incur as a result of this analysis. Individuals should consult with their personal financial advisors.